Psychologists tell us that it’s impossible not to lie, that we all do it every day, consciously or unconsciously, in one way or another. This view almost makes it look like lying is normal and that a certain amount of lying is okay. But even the psychologists who make this claim admit that lying can become addictive and destructive, destroying relationships, families, communities, even whole countries. Alhamdulillah, the Quran is clear on where the good road lies. 1. WE ARE NOT TO LIE, EVEN IF THIS MIGHT WIN US AN ADVANTAGE. 2. WE’RE NOT ONLY TO AVOID LYING OURSELVES, WE’RE ALSO TO AVOID SUPPORTING LIARS IN THEIR SIN. 3. WHEN WE LIE, WE LIE FIRST AND FOREMOST TO OURSELVES— WHICH PUTS US ON A SLIPPERY SLOPE TO HELLFIRE. 4. LYING IS A DISEASE OF THE HEART THAT ONLY GETS WORSE IF LEFT UNCORRECTED. 5. LYING— ESPECIALLY LYING ABOUT ALLAH— IS A SYMPTOM OF INJUSTICE AND RESULTS IN EXTREME HUMILIATION. 6. HOW DO WE TELL LIARS FROM TRUTHTELLERS? ALLAH DOESN’T GUIDE LIARS. 7. 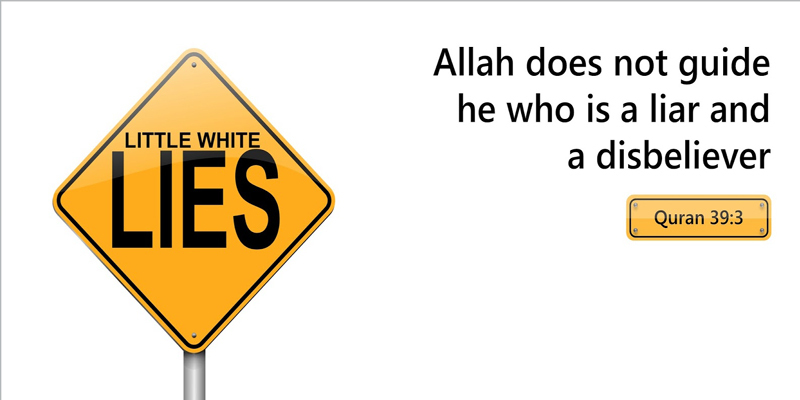 WE DON’T NEED TO WORRY ABOUT GUARDING OURSELVES AGAINST DECEPTION; ALLAH IS EVER READY TO PROTECT US. 8. NO ONE CAN EVER GET AWAY WITH LYING; IN THE END IT WILL BE CLEAR WHO WAS TRUTHFUL AND WHO WAS NOT. 9. THE TRUTHFUL HAVE A WONDROUS REWARD! Embrace truth— it’s your God-given friend!